Toronto Apostille Authentication Legalization Services – Do you live in the Greater Toronto Area and have been asked to get an Apostille or Authenticate Legalize a Canadian document to be used in a foreign country? If so, like most people that have, you are probably thinking I don’t know what Apostille, Authentication, Legalization means let alone how do it. Well not to worry you’re not alone and as Canada’s first service provider Authentication Legalization Services Canada has 25 years’ experience helping people like you. It’s important to know that if you are going to use a Canadian document for official purposes in a foreign country it’s a required step to validate the document before doing so. This is done to help remove the burden of proof for the person receiving the document as to whether it’s a Canadian issued document. This may apply to a Canadian Birth Certificate, Marriage Certificate, Death Certificate, Degree, Police Check, Corporate Document or Power of Attorney to name a few documents that people from the Toronto area apostille, authenticate, legalize for use internationally. If you have been asked to get an Apostille or Authentication Legalization in Toronto, Mississauga, Brampton, Markham, Vaughan, Richmond Hill, Oakville give us call we can help. The process in Canada to validate documents for use internationally is called authentication and legalization. Other countries, including the one where you are using your document, may use the Apostille process to validate documents for use internationally. Why and What’s the difference you ask? Great question we get it often. The original process to validate a document was authentication and legalization, which many countries still follow. In 1961 several countries decided to use a new process calling it Apostille. Although the process maybe slightly different the important fact is they are equivalent. So if you have been asked to get an Apostille for your Canadian document by following the authentication and legalization process it will be accepted in any Apostille county. The first step of authenticating your document takes place in Ottawa at Global Affairs Canada. Global Affairs Canada has many requirements for the authentication of documents which depend on what type of document it is. To ensure the quick authentication of your document it is crucial that you meet their requirements, one benefit of using our services is the guarantee that it will. Another process in Ontario for the authentication of documents is done at Official Document Services in Toronto. If using this method it’s important to know that you will probably still require authentication at Global Affairs Canada. To save you time and any extra expense speak with one of our friendly international document specialists now. Some of our clients need to order a new Birth Certificate, Marriage Certificate, Death Certificate for the authentication and legalization process. If this the case for you it is easy to do it online using the below links. When you order a new certificate you can also have it sent directly to our office to save processing time. With so many post secondary schools in Ontario over the past 25 years our educational document specialist have worked with many if not all of the accredited Universities and Colleges. Assisting foreign students and graduates going to work abroad has been an area of service we have concentrated on making sure your transition to a new foreign job is stress free. Depending on why and what you are doing with your education document will determine if you need to use your original or if a notarized copy will do the job. In certain situations, an original degree or transcripts will be required. If that is the case for you the below links will help you order new ones for the authentication and legalization process. We have helped the largest to the smallest Ontario corporations expand into new foreign markets or maintain present ones. Whatever the case for you or whatever the corporate document one of our specialists will be able to assist you. Some of the more common documents that we process are Certificate of Incorporation, Articles of Incorporation, Certificate of Amalgamation, Certificate of Good Standing, Director’s Resolutions, CRA Certificate of Residency or Representation Agreements to name a few. Many of these documents will require a notary and if you need help with this step please let us know our in house notary is available to assist you. After your document has been authenticated by Global Affairs Canada (GAC) its ready for legalization at the embassy or consulate of the country in which it will be used. Similar to GAC each embassy has requirements, different processing times and usually charge a fee for legalization. Like most government requirements and fees they do change often and if not followed could result in your document not being legalized. I know that’s the last thing you need, but once again not to worry we can help. For those thinking of doing it yourself you may want to make contact with them as its the most difficult step in the process to help we have included a list of the Toronto Embassy Consulates below, good luck. 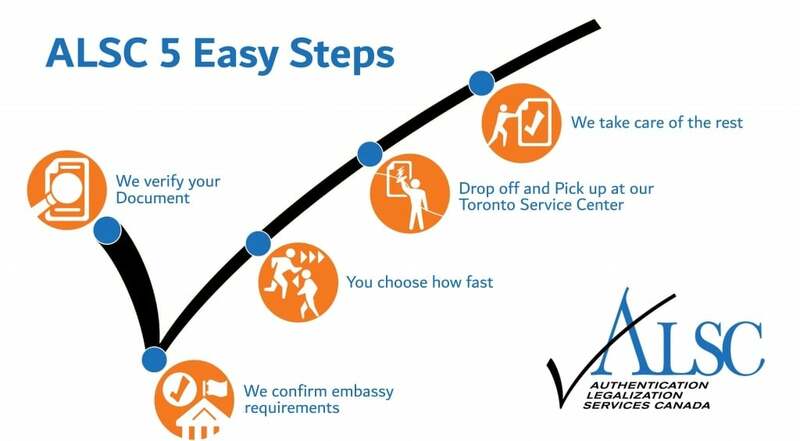 For those who want to get quick and easy apostille, authentication, legalization services in Toronto its simple. We know because we have done the hard work for you. By following our simple steps below, we ensure that your document is processed on time and correctly for use internationally. 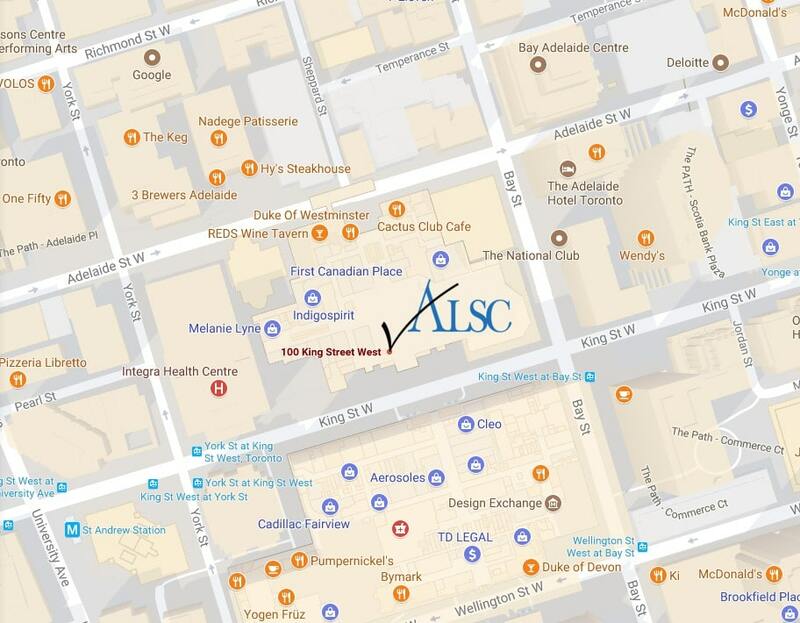 Once you have confirmed your service options we can then set up an appointment for you to drop off your documents and ALSC order forms at the Authentication Legalization Services Canada Toronto Service Center in Suite 5600- 100 King Street West, Toronto Ontario M5X 1C9. They will be waiting for you at the Toronto Service Center to ship the documents overnight to our national headquarters in Ottawa, where the documents will be processed. Now we do our part keeping you updated at every step via email. Upon completion of the process we let you know when you can pick up your completed documents at our Toronto Service Center, it’s that simple. Best of all it’s guaranteed! Click below to get started with the Toronto Apostille, Authentication and Legalization Specialists.